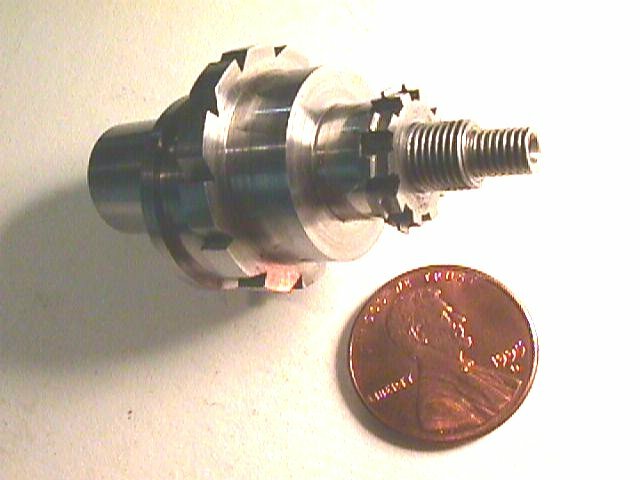 The photo show the Levin milling spindle being used with a flycutter to form wheel teeth. 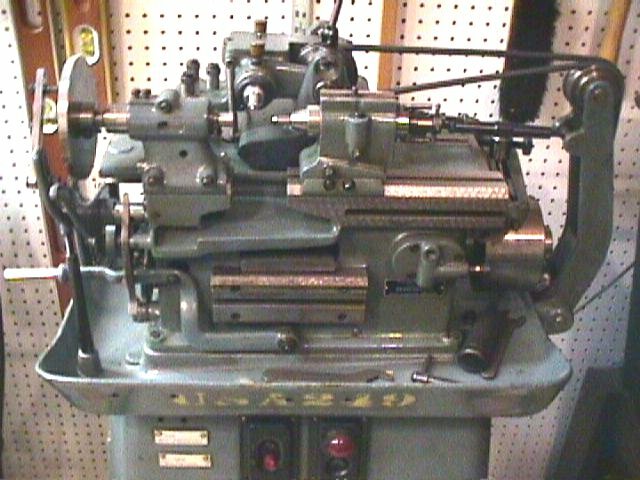 The home-made indexing attachment shown on the right uses a lever operated cam to move the index arm in and out of the plate notches. By moving the arm just clear of the notch, it is easier to count the spaces and line up the next notch. I was lucky enough to find a box of antique dividing plates for the lathe. They have 60 degree notches in their edges for use with a spring loaded index arm. 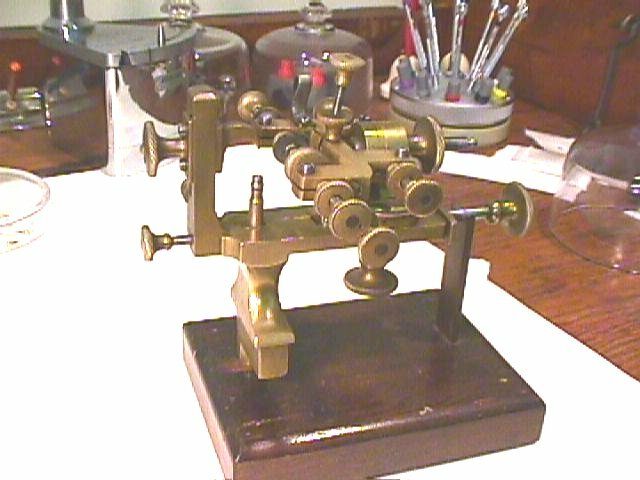 This antique brass "engine" is used to form or modify the tooth profiles of watch gears. For a new gear, the teeth can be cut with a simple saw made to form a square notch with the proper circular pitch and depth. The rounding-up tool will then round off the square corners of the tooth tips to form epicycloidial addenda. I don't do it this way, but the machine is quite photogenic. This is quite an old tool, but I'm unable to give an authoritative date. 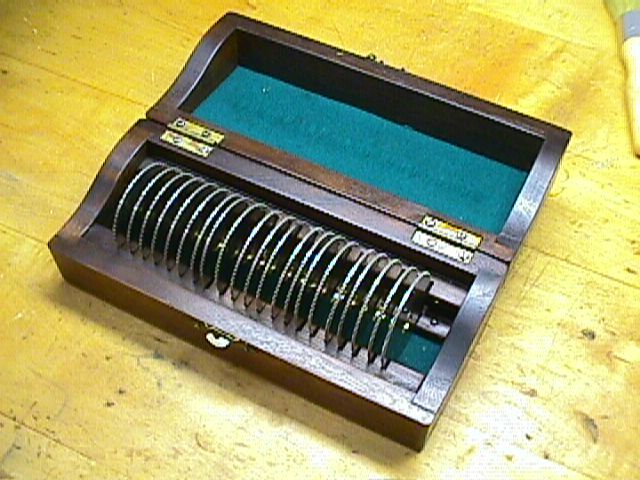 This tool, manufactured by the Swiss company Sixis, possibly came from a watch factory. Sixis is/was the trade name of Perrendoud et Fils of La Neuveville. 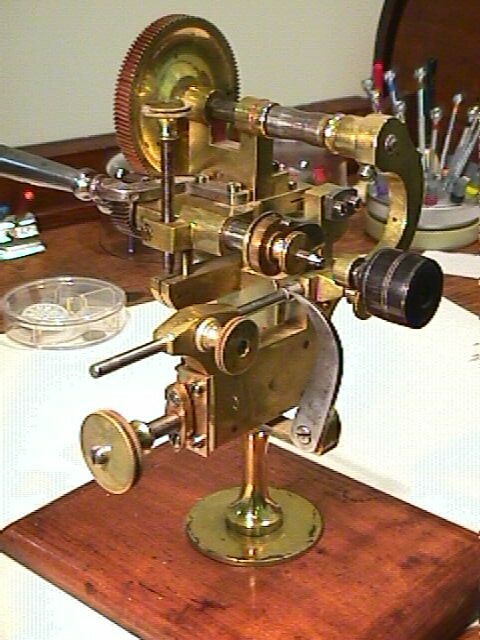 This machine forms and corrects the tooth heights of crown wheels used in verge escapement watches. I've never seen a verge movement except in museum collections, but it's best to be prepared. This tool dates from about 1810. I was very lucky to find this WW2 era machine salvaged from a bomb factory. It was designed for completely automatic operation. As shown here, I have removed the magazine feed since I only cut a few pinions at a time. It cuts very smooth pinions with no vibration or chattering. Another bomb factory rescue. I found this machine coated with 40 years of dust stuck to cosmoline: the machine had never been used. After complete disassembly and a bath in orange peel extract, it was restored to mint condition. I haven't used this machine yet because I have to make up a base, motor mount and drive pulley setup. Tournos-Bechler no longer sells this model, but they were kind enough to send me the original manuals and drawings. It was designed to cut smaller pinions that the Safag. 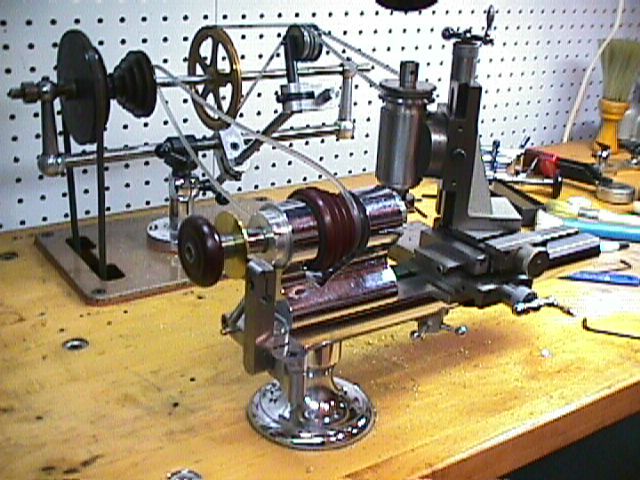 The headstock drive spindle that holds and indexes the pinion blank is spring loaded. 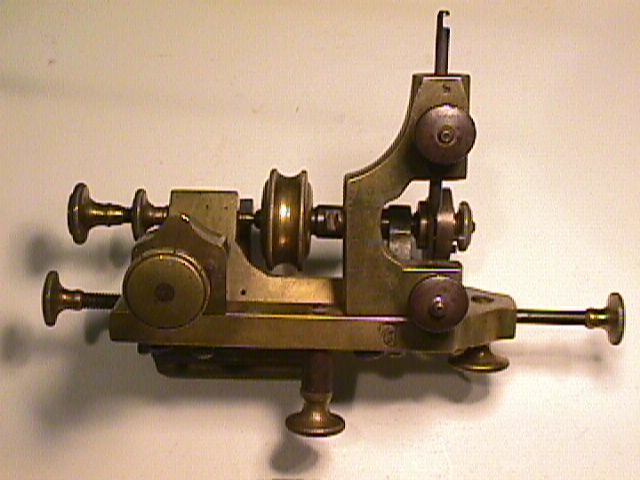 The tailstock is also spring loaded, so the pinion is held against the serrated drive center, but is somewhat free to "give" with the axial load applied by the cutter. This seems like a great idea for smooth cutting. I've never seen it described anywhere in the horological literature. This is a tool for making form-relieved cutters. It is almost too fantastic to describe. 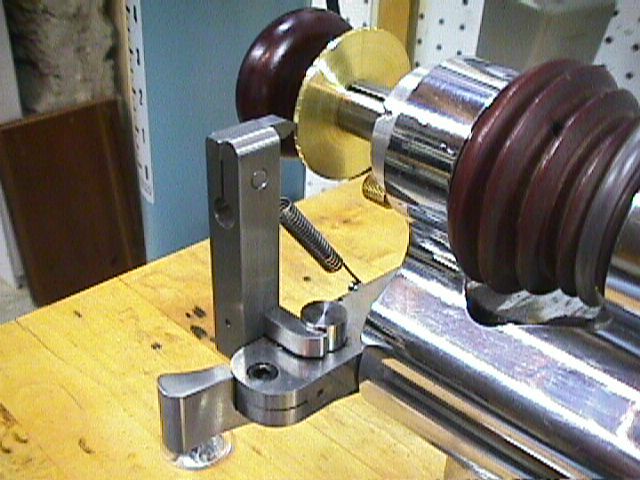 It holds the cutter on a mandrel between centers in the lathe. The mandrel centers are very slightly eccentric: just enough to move radially by the depth of one tooth's relief inset. A large ratchet wheel rotates the cutter blank around the mandrel. It moves by one ratchet tooth per revolution of the lathe. The result is that the cutter blank moves by one tooth per revolution and at the same time moves in and out because of the eccentric. A form tool in the slide rest cuts all the tooth profiles automatically on one side of the cutter. The form tool is then moved to the other side to finish the cutter. I couldn't resist making this devil 1/4 the original size. 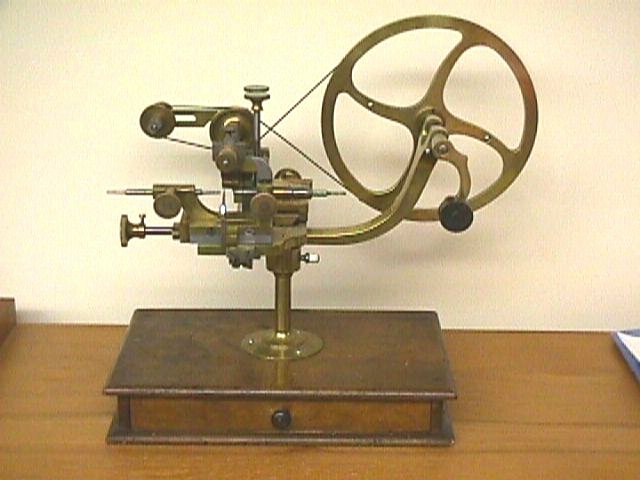 Model Engineer published plans calling the tool "The Eureka". Their drawings specify a 1/2 size tool. 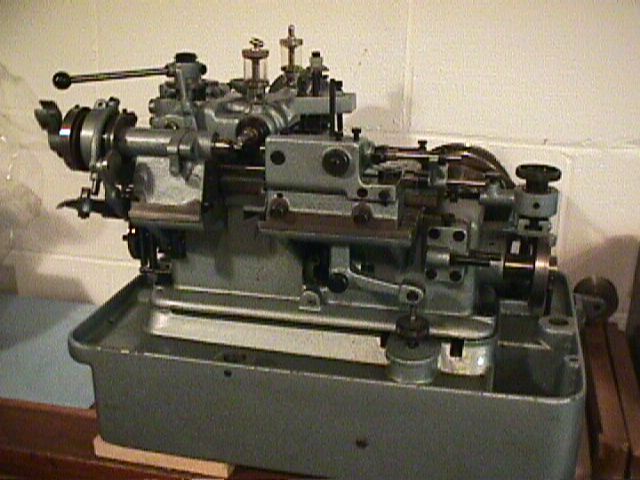 The original machine was described as "The Balzar backing-off device" in volume 2 of "Modern Shop Practice", 1919 edition. The article was reprinted by Lindsay Publications in "Tool Making 1905", so I suppose he must of had an earlier reference. As shown here it is work in progress: the plates that carry the ratchet pawls are not completed.